My daughter’s hair is a force to be reckoned with. It takes me hours to tame the “beast”. Way too often my daughter comes out from the shower with a tangled mess and then it is a nightmare to control. So many of the products we have tried out and invested in are too sticky, and really make brushing the day away in the evening pure torture. I mean don’t get me wrong I love having a daughter with pretty hair but it is so impossible to deal with the curls and to locate the right products. It was a no brainer for me when I was asked to try out a new kids line of hair products this week. Over the last few days we have been trying out Kinder Curls by Curl Keeper. These are quality products that truly offer great solutions to my stressful quest for a tear and drama free hair styling experience. I first want to tell you guys about Magic Mist Detangler. This conditioning spray is simply amazing. It is very easy to use; spray into wet hair, give it a few seconds to soften and moisturize and then you can brush their hair with no issue. Super softness and a delicious smell too! You never need to wash this product out of their hair. 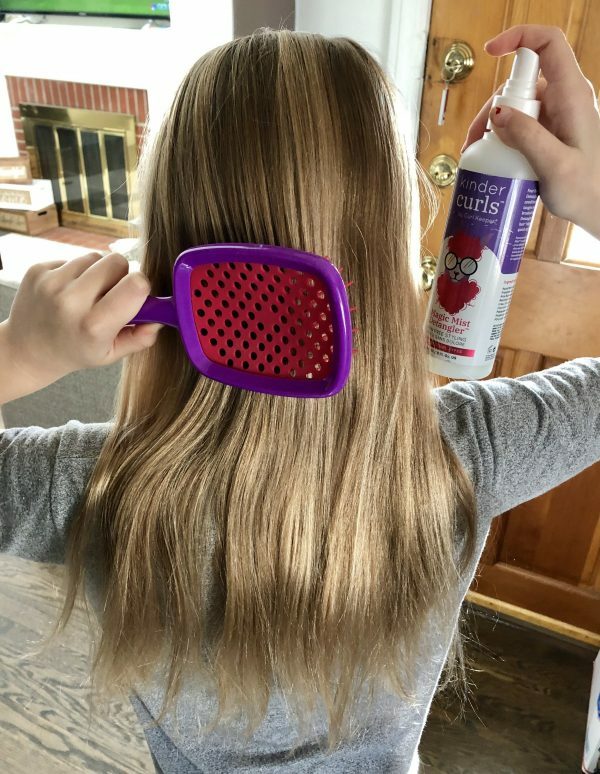 It should always be step one in your child’s hair care routine. It will cost you around $18.50 for an 8 oz bottle. I would be remiss if I didn’t mention the most important tool they offer for the entire hair care experience. This magic key I speak of is called a Kinder Brush and has just replaced all the brushes in this house after just one use. I did not hear one yelp or complaint and as a mommy I was thrilled for the tranquil and positive girlie experience. Finally. It has this great open design and is made to fit in their little hands. Open design equals flexibility which equals no tension and breakage. The brush costs around $14.99. Next up in our routine we tested their Super Curls product. This is great for anti frizz and styling. We applied the water-based product to her wet hair and let her curls dry naturally with such awesome bounce! There is no greasy residue and this product does not weigh the hair down. And guess what – the next day if you spray her hair and scrunch the curls you can reactivate this wonderful product! I love me a hair treatment that lasts for 2-3 days! A 12 oz bottle will run you $23.00 and is worth every penny. Oh – and it smells yummy! You simply must treat your little princess to this great new product line. Each item is free of silicone, SLS, dyes and phthalates. They are currently offering a 15% discount by using the code FAM15. The quality is great and you will have a happy kid with beautiful curls to match!